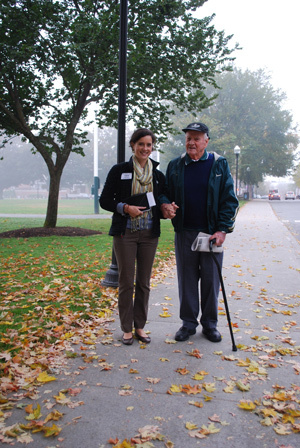 On the morning of September 30, Adrian Weiss ‘38 walked slowly but determinedly along the misty Green to his first Dartmouth class in 75 years. After his presence was announced by John Campbell, the Class of 1925 Professor of Sociology, Weiss received a round of applause from the 50 or so students in Carpenter Hall room 13. 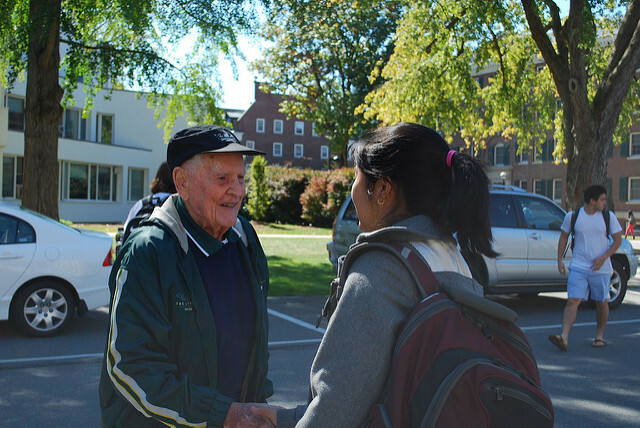 Afterward, an undergraduate went out of his way to greet Weiss and wish him an enjoyable day on campus. The previous two days, Weiss celebrated his 75th Reunion with fellow classmate Fran Mooney ‘38 and Jean Francis, the widow of Richard Francis ‘38. About 100 alumni and guests from the Classes of 1943 and 1948 were also on campus to celebrate their 65th and 60thReunions. As if one walk across campus from the Hanover Inn wasn’t enough, Weiss did it again for a 12:30 pm class, when he accompanied Melissa Matsuoka ‘14, an economics major and a women’s tennis player, to a macroeconomics class in Silsby Hall taught by senior lecturer Marjorie Rose. Women’s tennis head coach Bob Dallis arranged the meeting, as Weiss is a longtime fan of the Dartmouth team. As he walked along the Green that Monday morning, Weiss quickly recalled the names of professors, the location of campus buildings, and the fact that the all-women’s school Smith College is exactly 110 miles away from Hanover. Weiss said one of his treasured possessions is a signed book he received when he was a student from John Moffatt Mecklin, professor of sociology and his favorite Dartmouth teacher.